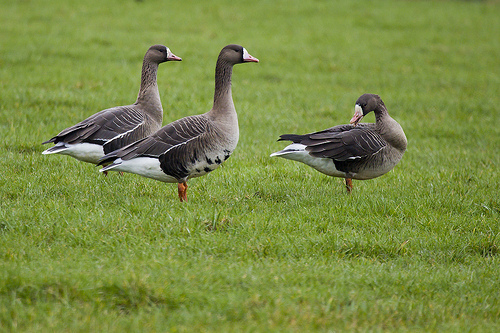 The White-fronted Goose is a winter visitor, staying in large numbers especially in the Netherlands. They nest on the tundras of Siberia and fly in autumn to the meadows of the Netherlands. Only with a lot of snow they will migrate farther south. The White-fronted Goose has a large pink beak, the beak of the Lesser White-fronted Goose is small. 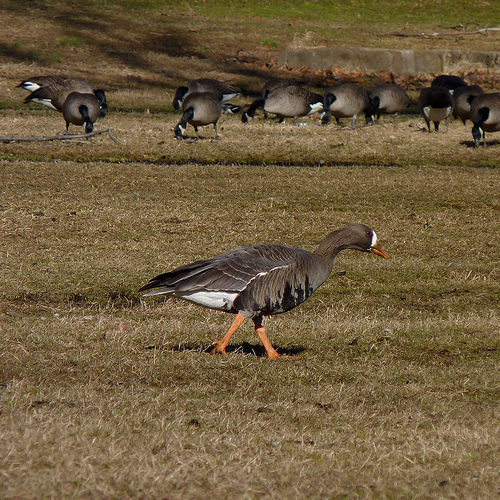 The White-fronted Goose is considerably larger. The White-fronted Goose has black spots on the belly and a white forehead. Almost all the other geese have plain brown bellies. The Greater White-fronted Goose has distinctive black patches on its belly. The Greylag Goose has no white spot at the base of the beak.